For 12 year old Armadale girl Anastacia Dawes life was a catastrophe. Much of her childhood had been spent managing diabetes, epilepsy, ADD and Tourette Syndrome. To top it off her mum was fighting cancer. She dreamed about studying singing at the WA Academy of Performing Arts but even getting to school was a challenge. It was hard for Anastacia to talk about it, so instead she wrote a song. It is now 12 months later and Anastacia will be performing Catastrophe on Saturday night with the Perth Symphony Orchestra. 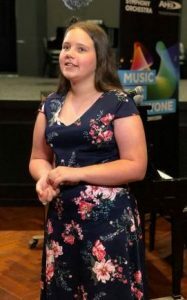 It is a dream come true for the student from Challis Primary School and a direct result of the transformation that has taken place in the school since since the principal decided to introduce a music program. Anastacia’s story came to light in the landmark ABC television documentary Don’t Stop the Music which screened in November. 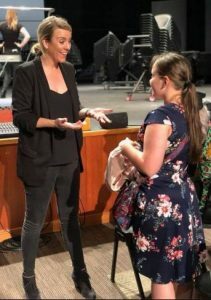 When conductor of the Perth Symphony Orchestra Jessica Gethin watched the documentary she was captivated by Anastacia’s singing. Jessica Gethin meets Anastacia Dawes. Photo Belinda Sherry. At one particular moment in the documentary the Challis school choir visited WAAPA to hear Eneskis vocal ensemble perform. The camera caught the expression on Anastacia’s face when the ensemble started singing. 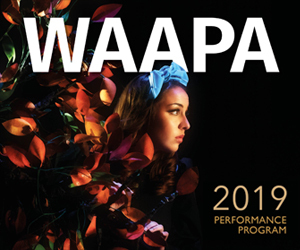 Within two weeks the song had been arranged for orchestra by WAAPA students Corey Murphy and Callum O’Reilly and on Wednesday night Anastacia rehearsed the song with orchestra for the first time. Joining them on stage was Challis music teacher Simon Blanchard accompanying on guitar. In fact it was pure coincidence that Anastacia’s talent was discovered. Blanchard had been receiving coaching from WAAPA lecturer Micheál McCarthy who happened to overhear Anastacia singing. McCarthy organised an audition for her at a specialist music school. Anastacia’s mother Kelly Dawes watched the rehearsal and said it was beyond her wildest dreams for her daughter. Anastacia Dawes will perform Catastrophe with the Perth Symphony Orchestra Kwinana at the Tianqi Lithium Symphony Spectacular, on December 1. Don’t Stop the Music is an ABC documentary by Artemis Media available on iView. Pictured top: Anastacia Dawes rehearses with the Perth Symphony Orchestra.